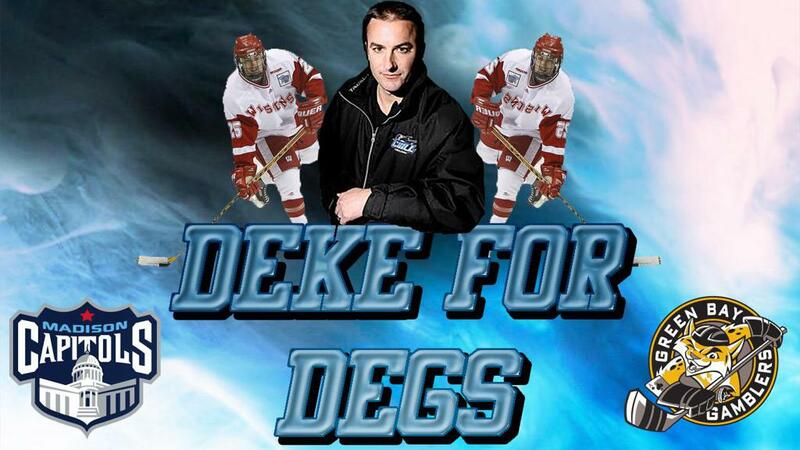 Middleton, WI – The Madison Capitols and Green Bay Gamblers of the United States Hockey league have joined forces to raise awareness and lend support in the fight against Multiple Sclerosis, and former Green Bay Gambler, AJ Degenhardt, and his battle with MS. The two teams will play a home-and-home series this weekend to finish off the 2018-19 season. Degenhardt, 36, played two seasons for the Gamblers from 2000-2002 before heading to the University of Wisconsin – Madison where he was a four year starter. While at Wisconsin, Degenhardt was an integral part of the team’s success, including his senior season when the Badgers brought home the 2006 NCAA Championship. On Friday night, AJ will be in attendance at the Green Bay Gamblers game as they host the Madison Capitols on MS night, presented by Marco. A portion of the ticket proceeds will benefit AJ and multiple sclerosis. The Capitols will be hosting a week-long auction with help from Dash Auctions, beginning at 12:00pm on Tuesday and running through 11:59pm on Saturday night following the game. • San Jose Sharks team-signed jersey on behalf of Joe Pavelski, including autographs from Pavelski, Joe Thorton, Erik Karlsson, and Brent Burns. • Chicago Blackhawks 2019-20 ticket package on behalf of Adam Burish. • University of Wisconsin – Madison 2018-19 team-signed jersey, 2018-19 team-signed stick, and 2019-20 “Evening At A Game” ticket package on behalf of Tony Granato.